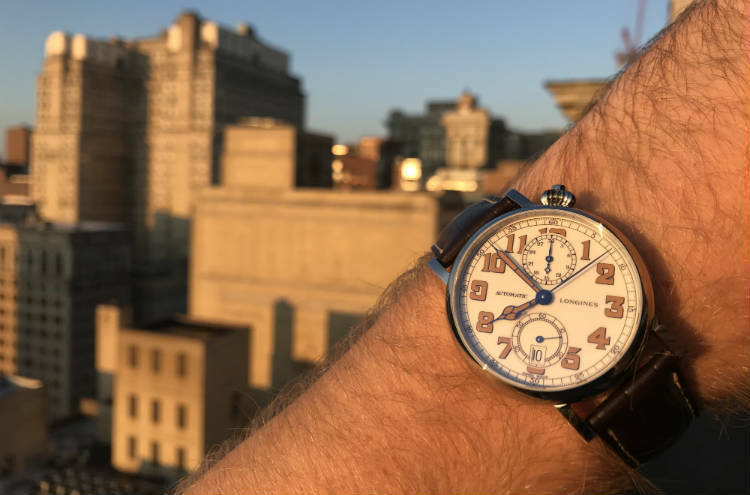 With it’s 40 degree angled face, onion crown with emerging monopusher, column wheel chronograph, and great provenance, can the Longines Avigation Type A-7 1935 be “that good” for only $3,500? 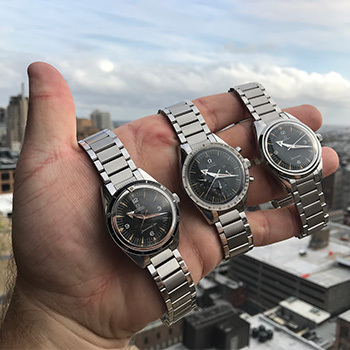 The purpose of this review is to explore that question, and offer up all the technical specs, sizes, and on the wrist opinions we could think of! The watch is steeped in history, being a homage piece to the 1930’s issued watch to the U.S. Army Air Corps. The original watch is a massive 51mm across, to be very readable for pilots, while not taking their hands off the flight controls. In 2012, Longines decided to being the Type A-7 back, this time with a 47mm case! For me this is still bloody huge…. Indeed many other people much have agreed. This article is relating to the latest release, reference number “L2.812.4.23.2” and stands at a much more wearable 41mm. I have the pleasure to borrow the watch for a week (Spolier alert: I loved it so much, it very well might become a perminent member of the collection). During that time, I wore it non-stop in a varying array of situations and different ensembles. I’m not usually used to such large watches as even though I have an 8″ wrist, I prefer sub 40mm watches or at lease ones that are thinner than this. With that being said, I didn’t find the watch to be overbearing, “heavy”, or hard to wear. Ideal From Boots To Suits! During the course of wearing the watch, I went from a three piece suit all the way to relaxing in the backyard by the fire pit in jeans and puffer jacket. Over the course of these varying scenarios I felt the watch easily traversed from smart to casual with ease. This makes the watch an attractive prospect at the price point, with this versatility. One can also imagine how well this would look with some strap changes too! How about a black alligator strap to make it an almost black tie affair? Or possibly a stripped NATO strap, making it the perfect casual weekend companion? This watch is so versatile! Authors note: for me this is a huge plus for any watch I personally buy. Having the ability to completely change the look and feel of a watch with a simple strap change is a huge value add. This has to be one of the most versatile watches I’ve worn to date for me. For me I personally loved the “crooked” orientation of the dial. It seems to be a very ergonomic position in ones day-to-day life. Whether I was typing on my keyboard at work, writing a letter, or driving my car I found to angle to be most comfortable. The 40 degrees seems to be spot on for the way one holds their hands / arms in a large array of activities. (I’m no pilot, but assume the same is applied here for its initial intended audience). The watch is quite substantial, and rounded. But as mentioned, it wears quite well on the wrist and fit underneath my dress shirts cuff will no issues (mainly due to it’s rounded case side). Not only was the face stunning to look at, but the case back had a plane covering the sun with beams of light emitting around it. A nice reference to the watch’s original intentions for sure. For me personally this watch is a home run. I think you’ll either love or hate its looks, and I’m 100% fine with that. I’d happy welcome if into my collection, not only for its looks but its heritage and how well it fits into my current personal style. Not to mention the great value one is getting for only $3,500 retails. Reviewed by Paul Anthony, on 28 February 2018 . "A unique and stylistically versatile watch. I love this watch's bold style and design. Despite its gargantuan size, it's a harmonious companion on the wrist!"